Here’s what’s up in the world of TV for Monday, June 9. All times are Eastern. Murder In The First (TNT, 10 p.m.): This new TNT drama from Seven Bochco looks to revamp his mid-’90s drama, Murder One. Like that earlier show—and plenty of others nowadays—Murder In The First will focus on a single investigation for its 10-episode season. 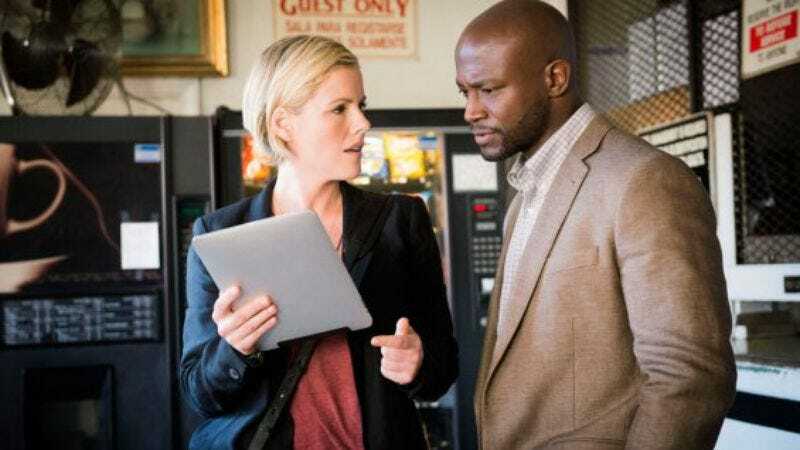 Taye Diggs and Kathleen Robertson star as fantastically-named homicide detectives Terry English and Hildy Mulligan. They face off against Harry Potter’s Tom Felton who plays a Silicon Valley prodigy/potential baddie. Todd VanDerWerff checked up on ol’ English, Mulligan, and Malfoy and was less than thrilled by the results. Louie (FX, 10 p.m.): Louie remembers his past in “In The Woods.” Erik Adams and Todd VanDerWerff would be more excited if he were to perform Stephen Sondheim’s seminal musical, Into The Woods. 24: Live Another Day (Fox, 9 p.m.): It’s 5 o’clock somewhere! Specifically on 24, which explores the 5-6 p.m. hour this week. Zack Handlen is cracking open a cold one to celebrate. The Boondocks (Adult Swim, 10:30 p.m.): With Eric Thurm busy getting a diploma (congrats Eric! ), a new TV Club writer will take a look at this pretty mediocre Aaron McGruder-less season. Justice League Unlimited (1 p.m.): In “Flash Point,” Lex Luthor fires on Cadmus and frames the League for the attack. Oliver Sava hates it when that happens. Peep Show (3 p.m.): This week’s episodes feature a histrionic Australian, a gun, and a £20,000 inheritance. Coincidentally those are the first three chapter titles in Phil Dyess-Nugent’s memoir. We’ve got Scott Von Doviak’s TV Review of Brazil With Michael Palin and Todd VanDerWerff’s aforementioned take on Murder In The First. Elsewhere, several TV favorites pop up on our Inventory of characters with moral codes. And over on HateSong, Kroll Show’s Jon Daly reveals his least favorite song. Pac-Man And The Ghostly Adventures (Disney XD, 12 p.m.): The second season premiere of this Disney show is subtitled “Ride The Wild Pac-topus.” That’s a good enough reason to include it on this list. Years Of Living Dangerously: Moving A Mountain (Showtime, 8 p.m.): In the first season finale of Showtime’s climate-change documentary, Michael C. Hall reports on rising sea levels in Bangladesh. After that he’ll presumably run off to the woods and become a lumberjack. Brazil With Michael Palin (PBS, 9 p.m.): Monty Python player-turned-travel documentarian Michael Palin kicks off his new PBS series about Brazil. Scott Von Doviak found it a pleasant way to spend an evening. ABC News Special: Hillary Clinton (ABC, 9 p.m.): Hillary Clinton sits down for a one-on-one with Diane Sawyer. She’ll definitely plug her new book. She probably won’t announce she’s running for president. Remember The Artist: Robert De Niro Sr. (HBO, 9 p.m.): Robert De Niro helps profile his father who was an artist whose work was shown alongside Jackson Pollack and Mark Rothko in the 1940s. Velvet Goldmine (FLIXe, 9:35 p.m.): Todd Haynes’ fantastic film chronicles the glam rock movement of the 1970s. Not only does it star Jonathan Rhys Meyers, Ewan McGregor, and Christian Bale, it also suggests Oscar Wilde was a space alien. MLB Baseball: Dodgers at Reds (ESPN, 9 p.m.): We’ve still got Tony fever which means all we can think about is the Artful Dodger hanging out with Annie. We’d probably buy that cast recording. Enlisted: Fox continues its Enlisted summer burn off. Les Chappell continues to be very confused by the network’s decision to cancel this excellent military sitcom.